-SSWMB/NIT-6.1 Annual Framework Contract for Lifting & Transportation of Garbage, Construction/demolition Waste from Main Roads, Streets, Narrow Lanes, Foot Paths, Medians, Open Spaces & Other areas within District South, Karachi to Garbage Transfer Station and Providing Human Resources (Sanitary workers & Collies) for Sanitation Work. –SSWMB/NIT-6.3 Annual Framework Contract for Lifting & Transportation of Garbage, Construction/demolition Waste from Main Roads, Streets, Narrow Lanes, Foot Paths, Medians, Open Spaces & Other areas within District West, Karachi to Garbage Transfer Station and Providing Human Resources (Sanitary workers & Collies) for Sanitation Work. –SSWMB/NIT-6.4 Annual Framework Contract for Lifting & Transportation of Garbage, Construction/demolition Waste from Main Roads, Streets, Narrow Lanes, Foot Paths, Medians, Open Spaces & Other areas within District Malir, Karachi to Garbage Transfer Station and Providing Human Resources (Sanitary workers & Collies) for Sanitation Work. –SSWMB/NIT-6.6 Annual Framework Contract for Lifting & Transportation of Garbage, Construction/demolition Waste from Main Roads, Streets, Narrow Lanes, Foot Paths, Medians, Open Spaces & Other areas within District Central, Karachi to Garbage Transfer Station and Providing Human Resources (Sanitary workers & Collies) Sanitation Work. -SSWMB/NIT-5.3 Techno-Economic Feasibility Study for ‘Establishment of Integrated Municipal Solid Waste Management System for Hyderabad and Qasimabad. -SSWMB/NIT-5.4 Techno-Economic Feasibility Study for ‘Waste to Energy’ in Karachi. NIT-2.1/2018-19 Lifting & Transportation of Garbage from GTSs and other areas of District South, Karachi to Landfill Sites. 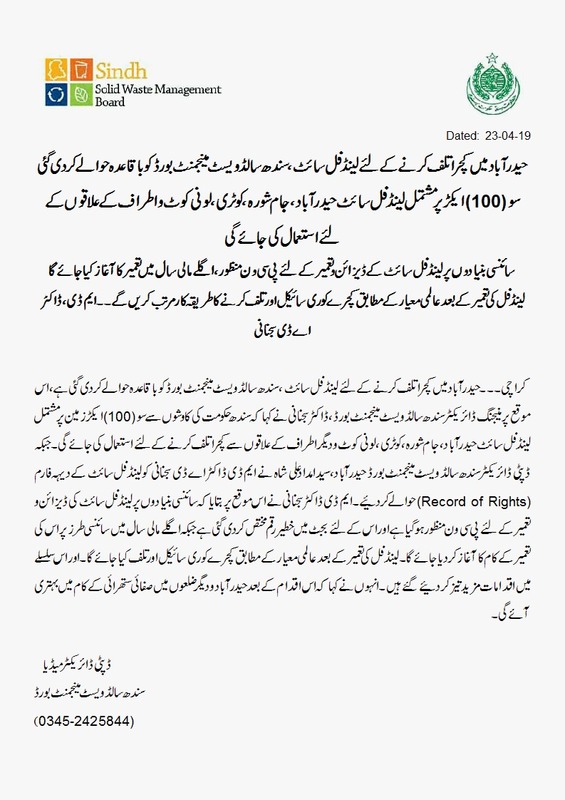 NIT-2.2/2018-19 Lifting & Transportation of Garbage from GTSs and other areas of District West, Karachi to Landfill Sites. NIT-2.3/2018-19 Lifting & Transportation of Garbage from GTSs and other areas of District Korangi, Karachi to Landfill Sites. NIT-2.4/2018-19 Lifting & Transportation of Garbage from GTSs and other areas of District Central, Karachi to Landfill Sites. NIT-2.5/2018-19 Lifting & Transportation of Garbage from GTSs and other areas of District East, Karachi to Landfill Sites. NIT-2.6/2018-19 Lifting & Transportation of Garbage from GTSs and other areas of District Malir, Karachi to Landfill Sites. NIT-2.7/2018-19 Lifting & Transportation of Garbage from GTSs and other areas of District Council, Karachi to Landfill Sites. NIT-2.8/2018-19 Operation and Maintenance of SSWMB Landfill Site at Deh Jam Chakro (Near Surjani Town), Karachi. NIT-2.9/2018-19 Operation and Maintenance of SSWMB Landfill Site at Deh GondPass (Hub River Road), Karachi. –I. Lifting & Transportation of Garbage from GTSs and other areas of District South, Karachi to Landfill Sites. -II. Lifting & Transportation of Garbage from GTSs and other areas of District West, Karachi to Landfill Sites. –NIT-1.1 Lifting & Transportation of Garbage from GTSs and other areas of District South, Karachi to Landfill Sites. -NIT-1.2 Lifting & Transportation of Garbage from GTSs and other areas of District West, Karachi to Landfill Sites. –NIT-1.3 Lifting & Transportation of Garbage from GTSs and other areas of District Korangi, Karachi to Landfill Sites. –NIT-1.4 Lifting & Transportation of Garbage from GTSs and other areas of District Central, Karachi to Landfill Sites. –NIT-1.5 Lifting & Transportation of Garbage from GTSs and other areas of District Council, Karachi to Landfill Sites. –NIT-14.1 Lifting & Transportation of Garbage from GTSs and other areas of District South, Karachi to Landfill Sites. –NIT-14.2 Lifting & Transportation of Garbage from GTSs and other areas of District West, Karachi to Landfill Sites. –NIT-14.3 Lifting & Transportation of Garbage from GTSs and other areas of District Korangi, Karachi to Landfill Sites. –NIT-14.4 Lifting & Transportation of Garbage from GTSs and other areas of District Central, Karachi to Landfill Sites. –NIT-14.5 Lifting & Transportation of Garbage from GTSs and other areas of District Council, Karachi to Landfill Sites. 13.1 Transportation of Garbage from GTSs and other areas of District South, Karachi to Landfill Sites. 13.2 Transportation of Garbage from GTSs and other areas of District West, Karachi to Landfill Sites. 13.3 Transportation of Backlog of Garbage from GTS (Sharafi Goth) to Landfill Sites. SSWMB/NIT-12.1, ‘Detailed Engineering Design and Construction Supervision of Garbage Transfer Stations & Misc. Works of SSWMB’. SSWMB/NIT-12.2, ‘Detailed Engineering Design and Construction Supervision of Landfill Sites of SSWMB’. 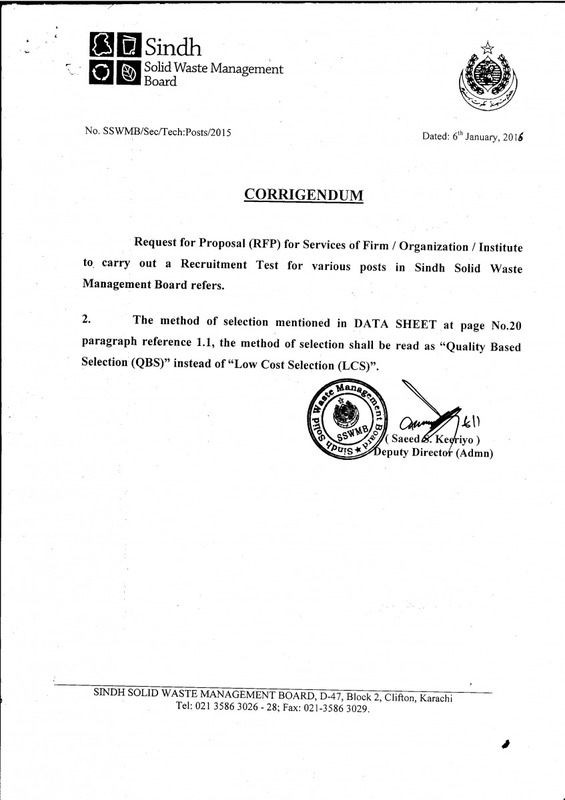 SSWMB/NIT-12.3, Third Party Monitoring, Evaluation & Supervision of ‘Front End Collection, Transportation & Disposal of Municipal Solid Waste Contract’ of DMC-South and DMC-West areas, Karachi. SSWMB/NIT-12.4, Third Party Monitoring, Evaluation & Supervision of ‘Front End Collection, Transportation & Disposal of Municipal Solid Waste Contract’ of DMC-East and DMC-Malir areas, Karachi. SSWMB/NIT-12.5, Techno-Economic Feasibility Study for ‘Establishment of Integrated Municipal Solid Waste Management System for Hyderabad and Qasimabad, Kotri and Jamshoro. Assignment-I: SANITARY ENGINEERED LANDFILL SITE OF HYDERABAD/JAMSHORO. NIT-9, CONSTRUCTION OF BOUNDARY WALL ON DIFFERENT SITES OF GTS AT KARACHI (CIVIL WORKS). SSWMB/NIT-2(C) Procurement of Printers, Scanner, Fax Machine. SSWMB/NIT-2(E) Procurement of LEDs / Smart TVs. SSWMB/NIT-1.1 Arrangements for Lifting, Transportation and Burial of Offals on the Occasion of Eid-ul-Azha for Saddar Zone of DMC South. SSWMB/NIT-1.2 Arrangements for Lifting, Transportation and Burial of Offals on the Occasion of Eid-ul-Azha for Lyari Zone of DMC South. SSWMB/NIT-1.3 Arrangements for Lifting, Transportation and Burial of Offals on the Occasion of Eid-ul-Azha for Gulshan-e-Iqbal Zone, DMC East. SSWMB/NIT-1.4 Arrangements for Lifting, Transportation and Burial of Offals on the Occasion of Eid-ul-Azha for Jamshed zone DMC East. NIT-13, Bid Document for Procurement of Computers, Laptop, Printers, Fax & Scanner*. *Note: The Category “B” regarding procurement of computer is dropped. The procurement of scanner under category “C” is dropped. NIT-11, RFP Supply, Erection, Testing and Commissioning of 120 MT Pit Mounted Type Electronic Road Weighbridge with One Year Maintenance along with parts at six different sites of GTS in Karachi. 12.1 Collection and Transportation of backlog of Solid Waste from different sites of Karachi to landfill site. 12.2 Cleaning / De-silting of Nallahs including transportation of sludge / waste to landfill site..
Re-NIT-9.1 Transportation of Garbage from Garbage Transfer Stations (GTS) DMC East to landfill sites. Re-NIT-9.2 Transportation of Garbage from Garbage Transfer Stations (GTS) DMC SOUTH to landfill sites. Re-NIT-7.4 FS – Integrated Medical Hazardous Waste System in Hyderabad. Re-NIT-7.5 FS – Integrated Medical Hazardous Waste System in Mirpurkhas. Re-NIT-7.6 FS – Integrated Medical Hazardous Waste System in Shaheed Benazirabad. 7.1 FS – Integrated Industrial Solid Waste System in Karachi (All Industrial Areas). 7.2 FS – Integrated Medical Hazardous Waste System in Karachi. 7.3 FS– Establishment of New Landfill Site for Karachi at Dhabeji. Including Preparation of Preliminary Design, PC-I Document, etc. Providing of Security Guards for Office of the Sindh Solid Waste Management Board Karachi. Providing Furniture & Fixture for Office of the Sindh Solid Waste Management Board Karachi. Providing & Fixing of Electrical Appliances for Office of the Sindh Solid Waste Management Board Karachi. Providing & Fixing of Network/ Computer System for Office of the Sindh Solid Waste Management Board Karachi. Supply & Installation of Diesel Generator at Office of the Sindh Solid Waste Management Board in Karachi. Providing of Security Guards (Male) at office of the Sindh Solid Waste Management Board in Karachi. Pre-Qualification Document S.No. 9 for Plantation for GTS and SWM Sites C-VI and above (CE10)- Larkana. Pre-Qualification Document S.No. 8 for Supply of Sanitation Material and Safety Equipment’s – Larkana. Pre-Qualification Document S.No. 7 for Plantation for GTS and SWM Sites C-VI & above (CE10) – Larkana. Pre-Qualification Document S.No. 6 for Complaint Management System PEC C-6 – Larkana. Pre-Qualification Document S.No. 5 for Central Control Room for Monitoring System PEC Category – Larkana. Pre-Qualification Document S.No. 4 for Community Awareness & Social Mobilization- Larkana. Pre-Qualification Document S.No. 3 for Supply of Specialized Solid Waste Machinery / Vehicles – Larkana. Pre-Qualification Document S.No. 2 for Revamping of Entire Bin System & Face Lifting in Category C-5- Larkana. Pre-Qualification Document S.No. 1 for Civil work for GTS, Central Room for Monitoring System – Larkana.